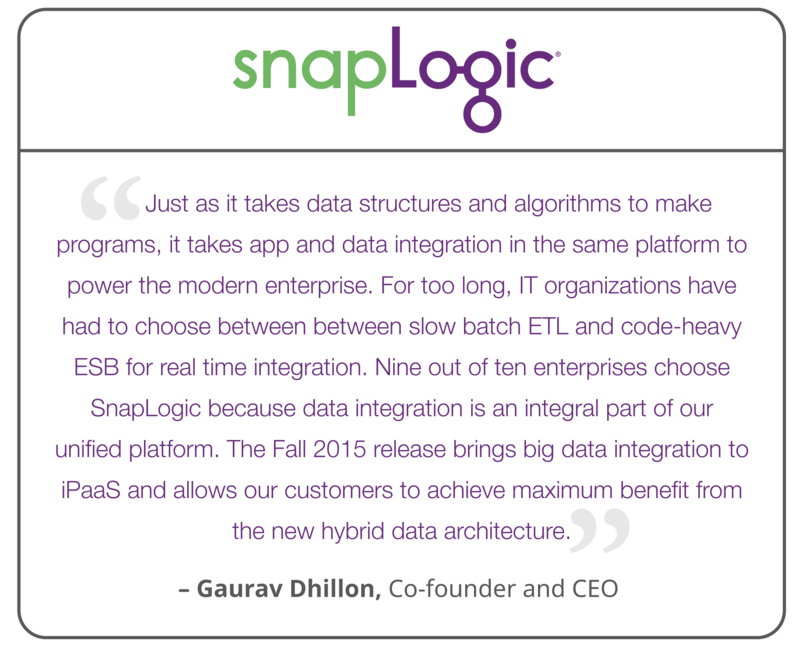 SAN MATEO, Calif. — September 29, 2015 — SnapLogic, the industry’s first enterprise integration platform as a service (iPaaS) for big data, today announced the Fall 2015 release of its SnapLogic Elastic Integration Platform. The new release adds new capabilities for big data integration including Spark data processing, a new Snap for Cassandra and support for Microsoft Cortana Analytics, enabling customers to easily build pipelines that orchestrate and transform data using the frameworks of their choice. With the Fall 2015 release, SnapLogic customers can now connect to virtually any application or data source at any speed, anywhere – in the cloud, on premises and natively in a Hadoop or Spark cluster. The Sparkplex – SnapLogic customers can choose to run their data and application integrations in the cloud, on premises and natively in a Hadoop cluster. The new Sparkplex allows customers to choose to run their pipelines on Spark, which is optimal for real-time processing tasks. The Sparkplex consists of a Translator, which takes SnapLogic data pipelines and converts them to Spark code; a Coordinator, which connects the Sparkplex to the SnapLogic visual pipeline designer and dynamically scales nodes with the processing load; and Nodes, which scale out elastically within a big data cluster. A new Spark Snap – SnapLogic provides 300+ pre-built intelligent connectors called Snaps. The Spark Snap enables customers to quickly create Spark-based pipelines using SnapLogic’s intuitive, drag-and-drop interface. These high-performance pipelines can draw data from virtually any source and are ideally suited for memory-intensive, iterative processes. With this addition, customers can choose to use either MapReduce or Spark for data processing, depending upon factors such data size, latency requirements, and connectivity. With the combination of the new Sparkplex and Spark Snap, SnapLogic customers enjoy the performance of Spark without the time and effort involved in creating and maintaining hand-coded integrations between data sources and a Spark cluster. Also new with the Fall 2015 release is a Snap for Apache Cassandra, the scalable, NoSQL database designed to handle large datasets. With this addition, customers can choose the big data store best suited for the project at hand. The SnapLogic Elastic Integration Platform also supports Cloudera, Hortonworks and MapR, allowing customers to get more out of their investments in Hadoop by making it easier to get large amounts of data into and out of these systems. SnapLogic also announced today its support for the Microsoft Cortana Analytics Suite. The company now provides fast, self-service data connectivity to and from Cortana Analytics and Azure data services. Points of integration include Snaps for Microsoft Azure SQL Data Warehouse, Azure SQL Database, and Azure Blob Storage. SnapLogic’s Snaplex can also be deployed on Azure resources (Azureplex). Improvements to the visual pipeline Designer: the ability to create pipeline execution tasks directly from the drag-and-drop interface as well as the ability to re-order tabs in the Designer when working on a number of pipelines. Account impact analysis: For large enterprises using multiple accounts for applications, administrators now have important visibility into which accounts are tied to specific dataflow pipelines. SnapLogic continues to enhance its library of Snaps for data sources and endpoints on premises, in the cloud or in hybrid cloud environments. New MultiJoin Snap: a streaming Snap that joins two or more streams at highly optimized performance. For more information on the SnapLogic Fall 2015 release, visit www.SnapLogic.com/Fall2015. For more information on SnapLogic’s support for Microsoft Cortana Analytics and Azure, visit www.SnapLogic.com/Microsoft-Azure. 1 Forrester, “Four Steps To A Data Management Strategy In Light of Big Data,” by Mike Gualtieri and Nasry Angel, February 26, 2015.